Years ago, I read Anne of Green Gables by L.M. Montgomery with my daughter and I’m still nostalgic for the shared enjoyment. When I saw Sarah McCoy wrote a novel focusing on Marilla Cuthbert, the woman who took Anne in and grew to love her as a daughter, I knew it was a book I had to read. 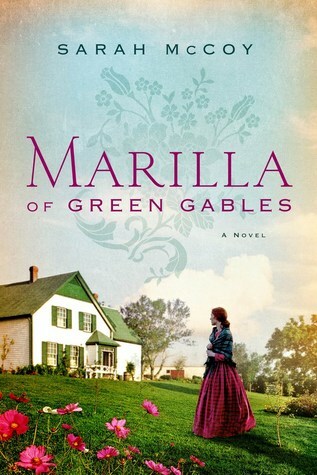 Marilla of Green Gables is a sweet prequel to the beloved Anne series. It opens with a young Marilla working devotedly alongside her brother, Matthew, on their parents’ farm. Her father, Hugh, is a man of few (to no) words. Her mother is more sociable but currently isolated due to a difficult pregnancy. Marilla’s Aunt Izzy has just arrived from the city to help out. Izzy tries expanding Marilla’s world, if only by taking her out more to spend time with the neighbors. Marilla meets the girl who will be her closest friend, Rachel White. Marilla also becomes reacquainted with a neighbor, John Blythe. The two are destined to fall in love. Unfortunately, tragedy strikes. Marilla’s mother dies in childbirth. Her last words extract a promise from Marilla to take care of her father and brother. No doubt, Marilla misinterprets her mother’s intention. She takes it into her head that she has promised never to leave Green Gables – never to marry or have a life of her own. Maybe it’s an excuse. She loves her home and doesn’t want to leave. Marilla is a native of Prince Edward Island. During the time frame of the novel, Canada is undergoing an upheaval as conservatives (those loyal to the Crown) and liberals (those who look to the U.S. as an example of freedom) come to violence. Marilla comes from a long line of conservatives. John is a liberal. Additional historical context is provided with Marilla’s response to slavery in the United States. Through charity work, Marilla comes in contact with ex-slaves who have escaped by crossing into Canada. Although slavery is against the law in Canada, slave catchers are active and are supported by the government. Marilla and her aunt Izzy work with a Catholic orphanage to help runaways. This is more dangerous work than I would have expected, imagining Canada as a more welcoming haven. The injection of these historical bits adds drama and interest to Marilla’s tale. The failed courtship gives the story poignancy and provides a plausible backstory for the Marilla of Anne’s story. You don’t have to have read Anne of Green Gables to appreciate Marilla of Green Gables, but you’ll be missing out on a beautiful classic if you don’t. Like L.M. Montgomery’s works, this book can be enjoyed by older children and adults of all ages.